Alexandra Cavoulacos and Kathryn Minshew. 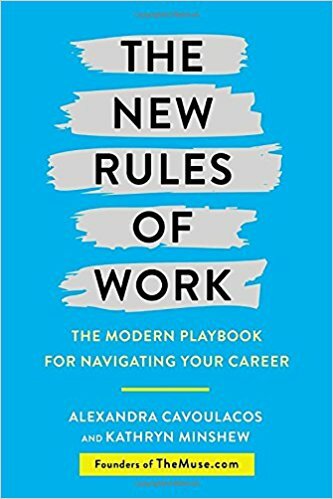 Cavoulacos and Minshew begin each chapter with the Old Rule that applies to how job searching use to be and pairs it with new rules. As I was reading through the book, I’ve found the evolution of these rules starling and surprising how much has changed in a short little time. I’m not old enough to have been in the job market long, but for the most part I’ve been going by the “old rules” of jobs. For most of my life, I’ve had a vague idea of doing adult job hunting (there was no high school class on it!) and from my recent experiences am surprised how hard it can actually seem. The constant plug in with their website TheMuse.com annoyed me a bit. But I could understand the reason for this. They need more traffic to their site. Hell, if someone would give me a book deal I would be plugging the heck out of this blog.